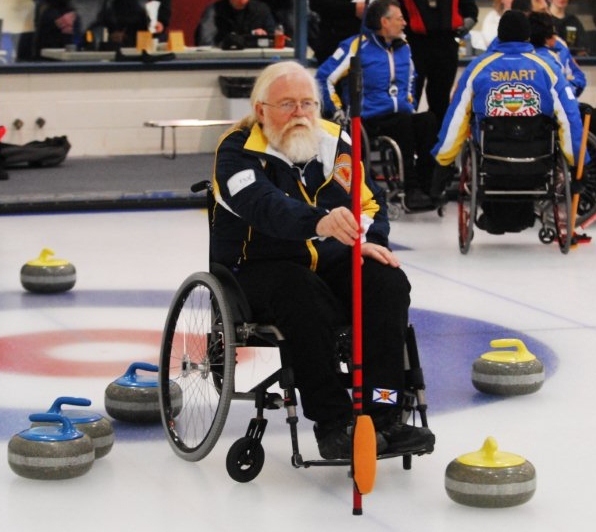 As part of its commitment to bring new participants into the club, Regina's Callie CC is continuing its wheelchair curling program. If you use a wheelchair or know someone who does, join the fun. Contact Bob Capp at (306) 789-0367 or contact the Callie. The 4th Annual Wetzikon Invitational will take place October 22-23 at the Wetzikon Curling Centre, near Zurich SUI. Competition details, including fees, accommodation and map can be found HERE along with an entry form to be completed by September 30. Norwegian Open October 14-16. Registration deadline August 19. This year's Norway Open will be held at the Halden Curling centre from October 14-16. The registration deadline for this event is Friday August 19 and full details including cost, transportation and accommodation can be found HERE. Email Anne Grethe Bremnes for more information. Nova Scotia skip Mike Fitzgerald, who shares with Colleen Jones a record of four consecutive provincial titles, is retiring from his job and moving to New Brunswick where he and his wife Anna spent their childhood. “I depart with mixed feelings," said Mike. "Loss in leaving a team that had success from a great work ethic and good coaching. Then there is the excitement of retiring and moving home knowing I have plenty of time to help the New Brunswick program develop. Fitzgerald was known in Lakeshore Curling Club as the ultimate competitor. He could be found at the club at least six times a week either practising or playing. He also worked with new curlers to improve their skills. Quiet and reserved off the ice, you would never find him talking of his accomplishments. Good luck, Michael. We'll be looking forward to New Brunswick challenging at future Nationals. There is very little news from Team Canada other than "Team Canada has been meeting and practicing on a regular basis." There had been hopes to organise an Albertan summer camp for individuals who caught the attention of national coaches during last season's tour. This did not materialise because of unspecified "challenges" but it is hoped that a camp (details have not yet been circulated) can take place at the end of September in Richmond BC. I am told invitees will be those who displayed the most promise based on (the) various camps from last season or as a result of observed performances and success at the Canadian Championships. Jim Armstrong update: Jim's son Greg has been moved to a federal prison in Mississippi. Jim tells me there "are some interesting scenario's developing" but his son's present situation prevents him from making good on his promise to tell his side of the story in public. It is a story that the CCA have apparently heard and accepted for Jim to remain on the programme. Quesnel resident Alison Duddy features prominently in a report by Percy Hebert of the Quesnel Cariboo Observer. She talks about her team's performance at last month's Cape Cod Summerspiel where her provincial team placed second in a field that included teams from Scotland Russia and USA. The report, which includes game situations, strategy, tips and lots of credit where it was due, is the kind of reporting that we need to encourage if wheelchair users unfamiliar with the sport are to be enticed to try it. Alison has featured several times here, never with a view to self-promotion, and sets an example that other curlers and coaches in general and Team Canada personnel in particular might consider emulating as part of a low cost, high benefit campaign to publicise the sport. An invitation to compete at the 5th Annual Lausanne International at the Lausanne Olympique CC can be found HERE. The field will be limited to 12 teams and the attached registration form should be returned by September 30. The US Curling Association has issued an open call for athletes interested in representing their country at the 2012 World Championships in South Korea. The trial will be held in Wisconsin at the Madison CC from October 20 to 23rd. The top eight candidates, chosen on both on and off ice criteria, will be required to compete in the USA Open in Utica NY and the Cathy Kerr Bonspiel in Ottawa. Expenses will be covered for those events. From that group, five athletes will be chosen for the mixed gender team that will compete at the Worlds. With two retirements from the US national team already announced, there is an excellent opportunity for ambitious wheelchair users prepared to put in the practice to make the team. Full details of the camp including registration and costs are available HERE. Visit HERE for more information on how to access funds but act quickly, the deadline for proposals is September 23, 2011. BC residents can contact Penny Bartel for assistance in putting together a proposal. Marc DePerno, team leader for the USA national team, has issued invitations to compete at the 6th Annual USA Open International taking place at the Utica CC November 11-13th, 2011. Full details, including special rates on accommodation and transportation, are available HERE. Registration deadline is October 10th. The field will be limited to 10 teams. More info from Marc DePerno. Wheelchair users, coaches and assistants not already participating in the World Class Performance Programme or the Scottish Wheelchair Curling Association's Spokes Programme are invited to attend an instructional camp on Sunday 4th September from 9.30am to 4pm at Greenacres Curling Rink. The Open Day will include both include “on-ice” and classroom sessions updating attendees on the latest technical and tactical thinking guiding the High Performance programmes. Tony Zummack, British national coach, has been working with the national training squad on adjustments to technique with an aim of improving delivery accuracy. This camp will be an opportunity for others to hear his thinking and familiarise themselves with what Britain's most experienced athletes have been learning. Tactical sophistication and situational awareness don't matter if you can't make your shots. Zummack believes his approach will improve accuracy, and September 4th is your opportunity to hear how he intends to do it. There is no charge for the Open Day but numbers are limited and will be issued on a first come first served basis. If you would like to attend the Open Day please e-mail to register.